Healthy donuts! Well, that’s different given the usual deep fried method behind most donuts available commercially. 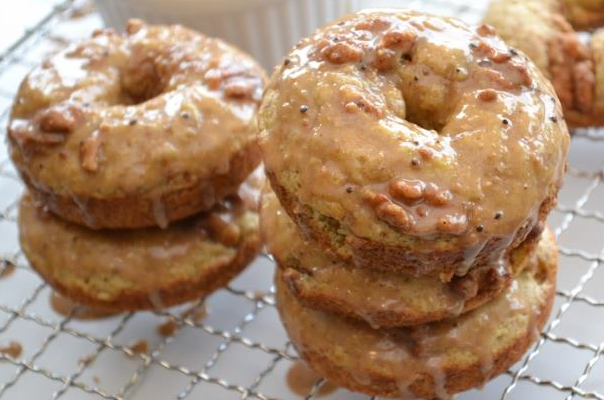 But these banana-walnut donuts are baked and that gives them a healthier edge; plus, they’re oh so yummy! A personal favorite, donuts are a welcome sweet-treat any time of the day. So bake a batch and drool in their taste. Note: Almond flour can be made at home by fine grinding peeled almonds. In a large bowl combine both the flours, baking powder, cinnamon and salt. Beat the eggs in a separate bowl. Then add vanilla and 2 tablespoons milk to them. Add the mashed banana to the egg mixture. Pour the wet mixture into the dry one and also throw in the broken walnuts (reserve some for garnish). Stir to combine everything nicely. The final batter should have a thick slightly flowing consistency. Preheat your oven to 220 degrees Celsius and dust a donut pan with cooking spray. Pour the donut batter into the donut pan and bake for 8 – 10 minutes or until the donuts become puffy. Meanwhile start making the glaze. Combine the softened peanut butter, remaining 1 tablespoon milk and powdered sugar until they become soft. When the donuts are done, remove the pan from the oven and let them stand for 5 minutes to cool down a bit. Then remove the donuts from the pan and place them on a wire rack for another 15 minutes. Finally pour the glaze over the ready donuts and sprinkle the reserved candies walnuts. Serve immediately.